I have reworked the daisy mandala to utilize the mirror image elements. I started by creating this page of flower elements to use in the design. 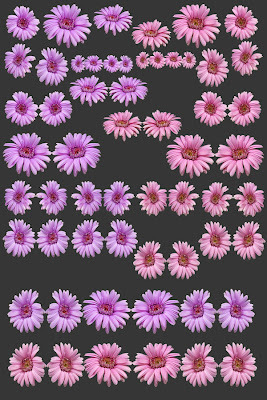 To the individual blooms, I have added the pairs of mirror images. In some cases, I have created double pairings in which I reverse the left and right images to create more than one version of the same pairing. By rotating the indvidual blooms and pairing them up in various ways, I could create and alost infinite number of elements to work with. The page also includes some line elements. That too, could be expanded. Now with the photos of a single bloom, we have created quite a wide variety of elements to work with. It is enough to create an interesting design.